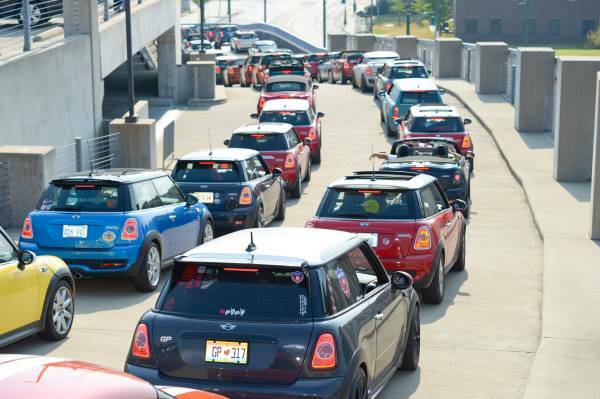 Woodcliff Lake, NJ – May 9, 2016 – MINI USA today announced the official list of Sponsors and Partners that will come along for the ride during MINI TAKES THE STATES 2016. The list includes Shell V-Power® NiTRO+ Premium Gasoline , Pennzoil PurePlus™ Technology , InterContinental Hotels Group , Pirelli Tires , Kem Krest® and Aquafina® . MINI TAKES THE STATES is a legendary cross country rally for MINI owners that kicks off at Atlanta Motor Speedway in Georgia, on July 9. From there, participants will make a cross-country journey through 15 cities, finishing the epic Motoring adventure at the Thermal Club motorsports complex in Palm Springs, California. MINI will be joined this year by Platinum Sponsor, Shell V-Power® NiTRO+ Premium Gasoline. Motorers can download the Fuel Rewards® app before the event and visit the Shell tent during MTTS to find out ways to earn additional Fuel Rewards. Pennzoil PurePlus™ Technology, found in every bottle of MINI Original Engine Oil, the recommended engine oil for MTTS, will also be a sponsor. “We’re pleased to partner with MINI for this cross-country journey. Shell has a history of providing premium products for drivers who demand the best, no matter whether they’re driving on or off the track,” said Heidi Massey-Bong, Sponsorship Manager for Shell. Silver Sponsor, Pirelli offers MINI approved tires for the MINI Paceman, MINI Countryman and MINI Clubman models. Participants will have the opportunity to win a set of MINI spec, star marked Pirelli tires. Full details will be available at the event. For the few hours Motorers won’t be on the road, they can rest easy while earning rewards at InterContinental Hotels Group, the Official Hotel Partner of MTTS. Additional event partners include Kem Krest®, the official MINI aftermarket chemical supplier and Aquafina®, the perfect way for happy bodies to stay healthy and hydrated while on the road. Earlier in the year, MINI USA also named Feeding America, the nation’s largest hunger-relief organization dedicated to fighting domestic hunger through a network of food banks, as the Official Charity Partner of the legendary cross-country road rally. Similar to years past, a portion of the proceeds from each registration fee will be donated to Feeding America. Stay tuned for more updates or visit MINITAKESTHESTATES.com to recieve email updates. For blog posts and press images from MINI TAKES THE STATES 2014 please visit the MTTS 2014 page on MINIUSANEWS.com. Media interested in updates on MINI USA can also follow us on Twitter at @MINIUSANEWS.